June 2016 is the 50th Annual Bill Monroe's Bean Blossom Bluegrass Festival and it's going to be a monster! The initial line up as of 10/9/15 has Del McCoury, Doyle Lawson, Seldom Scene, Larry Cordle, Tommy Sells, Ralph Stanley II, Joe Mullins, Kenny and Amanda Smith, Wildwood Valley Boys, Karl Shiflett, Special Consensus, Spinney Brothers, Band of Ruhks, Punches Family, Darrell Webb, Junior Sisk, and Larry Sparks with more bands to come! Bean Blossom, IN -- The Spinney Brothers, Canada's International Bluegrass band, made a special presentation at Bill Monroe Memorial Music Park in Bean Blossom, Indiana during their evening performance on Wednesday, September 23rd. Bean Blossom, IN -- The Bill Monroe Music Park & Campground, nestled in the beautiful hills of Brown County in Southern Indiana, is proud to announce the 49th Annual Bill Monroe’s Bean Blossom Bluegrass Festival taking place June 13-20, 2015. The event is the oldest, continuously running bluegrass festival in the world and draws music fans from around the globe. 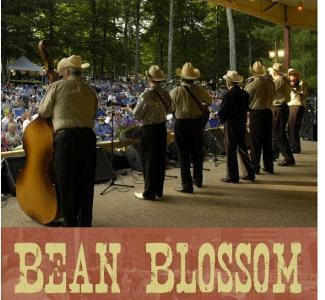 Bean Blossom, IN - The 40th Annual Bluegrass Hall of Fame & Uncle Pen Days Festival is taking place now, September 24-27, 2014, at the Bill Monroe Memorial Bluegrass Music Park & Campground in Brown County, Indiana. The 4-day event includes a stellar line-up of over 30 bluegrass bands, instrument and vocal workshops, jam sessions, camping, food, vendors, and fellowship. Tickets can be purchased by phone (800) 414-4677 or at www.BillMonroeMusicPark.com. The Bill Monroe Memorial Bean Blossom Bluegrass Festival, winner of the 2013 International Bluegrass Music Association’s IBMA Bluegrass Event of the Year Award, will hold their 48th annual festival June 12-21, 2014. This world famous event, known as the longest continuous running bluegrass festival in the world, will take place at the Bill Monroe Memorial Bluegrass Music Park & Campground in Bean Blossom (Brown County), Indiana. The John Hartford Memorial Festival has released another line up for the 2014 festival, happening May 29-31 at Bill Monroe’s Music Park & Campground in Bean Blossom, IN. Joining the initial line up of Peter Rowan, Pokey LaFarge, and Pert Near Sandstone will be Jamie Hartford & Friends, Danny Barnes, Larry and Jenny Keel, Mike Compton, The HillBenders, Leroy Troy, Bawn in the Mash, Rumpke Mountain Boys and many more. New to the festival will be Horseshoes and Hand Grenades, Lindsay Lou & the Flatbellys, The Haunted Windchimes, Scenic Roots, Julia Belle Swain Band, Old Salt Union, The Crunchy Western Boys, Sloppy Joe, The Downtown County Band, andMaria Carrelli. Indianapolis, IN -- The 47th Annual Bill Monroe Memorial Bean Blossom Bluegrass Festival begins this Saturday, June 8 and continues through June 15 at the Bill Monroe Memorial Bluegrass Music Park & Campground in Bean Blossom (Brown County), Indiana. The 8-day event includes a stellar line-up of over 55 bluegrass bands, Youth Bluegrass Boot Camp, instrument and vocal workshops, jam sessions, camping, food, vendors, and so much more. Tickets can be purchased by phone (800) 414-4677 or at the park’s website: Beanblossom.US. Camp Director Sarah Wasson will be heading up the 8th Annual Bean Blossom Bluegrass Boot Camp and instructors. Interested youth ages 6-18 years of age will be allowed to sign up for the fun but structured camp. The bluegrass music camp consists of professional instructors and will teach students in small group and one-on-one sessions - brand new through advanced. 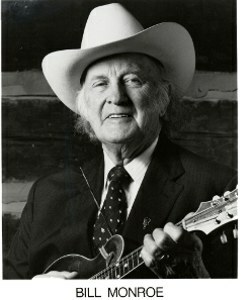 Indianapolis, IN -- The 46th Annual Bill Monroe Memorial Bean Blossom Bluegrass Festival will be held June 9 – 16, 2012 at the Bill Monroe Memorial Bluegrass Music Park & Campground in Bean Blossom (Brown County), Indiana. The 8-day event includes a stellar line-up of over 50 bluegrass bands, Youth Bluegrass Boot Camp, instrument and vocal workshops, jam sessions, camping, food, vendors, and so much more. Tickets can be purchased by phone (800) 414-4677 or at the park's website: www.beanblossom.US. Bean Blossom is the definition of a bluegrass music festival. This is what it is all about. Thomas Adler, author of Bean Blossom: The Brown County Jamboree and Bill Monroe’s Bluegrass Festivals, has answered questions about the bluegrass music Jamboree on the University of Illinois Press web site. This is timely because the week-long festival begins June 9, 2012. The Q & A article addresses simple questions as well as personal and inspiring questions. 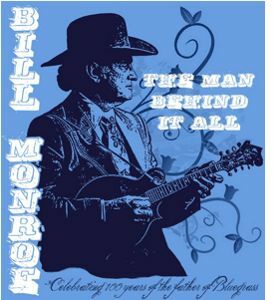 Indianapolis, IN -- The 46th Annual Bill Monroe Memorial Bean Blossom Bluegrass Festival will be held June 9 – 16, 2012 at the Bill Monroe Memorial Bluegrass Music Park & Campground in Bean Blossom (Brown County), Indiana. The 8-day event includes a stellar line-up of over 50 bluegrass bands, Youth Bluegrass Boot Camp, instrument and vocal workshops, jam sessions, camping, food, vendors, and so much more. Tickets can be purchased by phone (800) 414-4677 or at the park's website: www.beanblossom.US.